Intended nationally determined contributions (INDCs) are a critically important tool for the advancement of the ultimate objective of the UN Framework Convention on Climate Change, which is to stabilise greenhouse gas (GHG) concentrations in the atmosphere at a level that will prevent dangerous climate change. While the principal purpose of the INDCs is to encourage governments to increase the ambition of their commitments to mitigate GHG emissions, they have also served to clarify the overall scope of many national climate change plans and policies, including components such as adaptation and means of implementation. 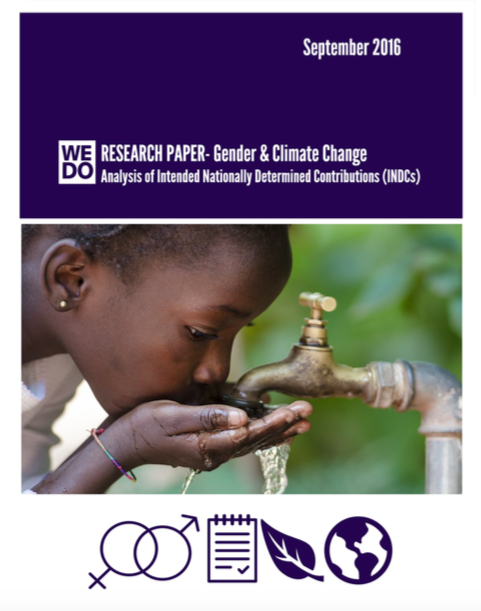 The objective of this analysis is to evaluate the extent to which submitted INDCs address women’s human rights and the linkages between climate change and gender more broadly. The importance of explicitly addressing these linkages in national and international climate change policy-making is well-documented. In short, comprehensively addressing the intersection of gender and climate change is essential for both advancing the fulfilment of women’s human rights and gender equality, and effectively addressing the multiple challenges that climate change poses. The overall conclusion of this analysis is that the submitted INDCs fall far short of the necessary commitments.